When one of my blog posts inspires a friend, a relative—or even a stranger—to write a detailed comment about one of their experiences, it gives me great pleasure. Some I like to share. This most recent example came as a result of my “Trains” post of 12/10/08. The writer, a friend of more than 35 years, is a glamorous woman who, it turns out—and much to my surprise—was once a tomboy. It is always fascinating when someone you thought that you knew well reveals a new (to you) character layer, especially when she can express it so well in the prose voice of a small child. The sound of a train transports me back in time. It is 1943 and our tiny clapboard house is a coal lump toss from the railroad tracks. The locomotive lulls me to sleep like a mother’s lullaby. Shhh, shhh, shhh, shhh, the steam engine cajoles, as the whistle blows in sweet harmony. The train’s clackity clack rhythm as it makes its way down the tracks sooths me like a mother’s heartbeat. The trembling earth gently rocks my cradle as the mighty engine passes. When my brother Robert is four and I am almost three, we play outside all day. Today, we are making mud pies with the black soot from the train. Robert is mixing worms in his. He likes to squish the worms up good with his hands first. We load the fresh mud pies in our red wooden wagon. The train whistle blows and we are so excited we forget about the mud pies and run as fast as we can to the end of the sidewalk, where a black and white striped gate comes down to block our path. Red lights flash. We wait. Sure enough, here comes the giant black engine, screeching and belching big puffs of steam and black smoke, its huge wheels going around as it does its job, pulling a string of freight cars and a red caboose. The engineer, wearing a blue and white striped cap and bandana, waves to us, as he always does. We rush to be the first to grab a lump of coal that bounces from the coal car. Robert got there first, as usual, but that’s all right because we’ll both play catch with it later. There must be a hundred freight cars, and bringing up the rear is the red wooden caboose. The conductor, watching from the window in a tiny room on top of the caboose, waves to us and we wave back. By the end of the day, we are covered with soot and must be a funny sight, because grownups, heading home from work, laugh at us. At bath time Mommy screams when she finds leftover squished worms in Robert’s pockets. Mommy has a surprise for us, too. She says we are moving to a new house, which at first makes Robert and me sad, because we will miss the trains. But when we arrive at our new house, we are happy to see it’s even closer to the tracks than the old house, and better yet, backs right up to them. And best of all, a river runs along the side of our house and the trains have to go over a trestle to cross the river. In the five years since we moved into this neighborhood, Robert and me have had lots of fun playing on the train tracks. Mommy walks the tracks, too, but not for fun. She uses them and the trestle as a shortcut to get to the next town where she works at Jarrett’s Beauty Bazaar. At the trestle she always stops and listens for the train’s whistle. If it’s not blowing, she figures it’s safe to cross and she quickly walks on the railroad ties to the other side. She has to be fast because the only place to stand if a train comes is a small platform that hangs over the river halfway across the trestle. On this one day, Robert has an idea. He says it would be real fun to be on the platform while a train is going by, so that we can see it real close up. So we wait and listen, and when we hear the whistle blow far off in the distance, we run across the trestle as fast as we can, stepping on the ties. I can see the ripples of the river far below, between the ties. The tarry smell of the ties baking in the sun hits my nose. Then we hear the whistle again, louder this time. We jump onto the platform, and look back down the tracks just in time to see the train rounding the bend. The train is speeding straight for us, it seems. As it passes, the platform shakes so much I can feel my brains rattle. We cling to the platform railing for dear life. I grip the railing so tight my knuckles are white. I look down at the river below, so far away. The train’s giant wheels roar past us so fast, its whirlwind feels like a tornado. I’m afraid we are going to get sucked right under those wheels. This is the longest train I have ever seen. There must be a gazillion freight cars, but at last I am so happy to see the caboose. I hope Robert doesn’t have any other great ideas today. Well, during our childhood Robert did have many more ideas, some great ones and some not so great. This was one of many adventures I experienced as I tagged behind him, exploring the tracks and the trestle. Those memories all return to me whenever I hear the sound of a train. Copyright © 2009 Alvera (McClain) Winkler. This entry was posted on Wednesday, January 7th, 2009 at 5:45 pm and is filed under essays, kids, non-fiction, writing. You can follow any responses to this entry through the RSS 2.0 feed. You can leave a response, or trackback from your own site. Thanks, Alvera…that brings back great memories. I could almost feel my teeth rattle as that train passed you on the platform. I love the photo, as well… I only hope it doesn’t show you tasting one of your brother’s mud pies. You certainly are a glamorous woman, and what a great memory! You and Robert were/are adorable, and Olivia sure resembles you!! Love you, Cuz! 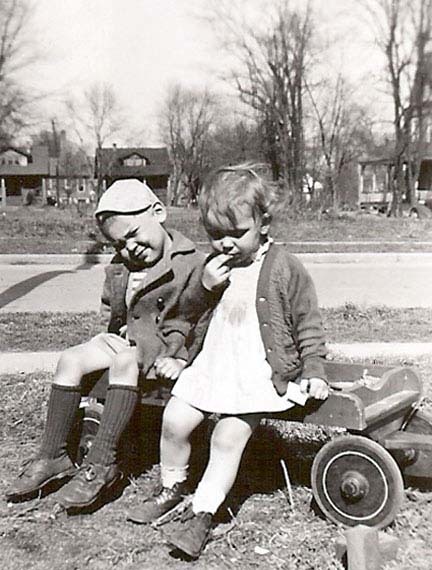 My grandparents lived across the road from a railroad track.I loved being over there when the trains came through. Then when I was older, when I married the first time, those same railroad tracks were right behind the house I lived in. those tracks are now gone, but I’ll never forget them. Seeing you today, as the beautiful and well poised lady I know, it’s hard to believe you were once a tomboy! I got so excited while reading your story (through your explicit description of the train as it was roaring past you) I could almost feel how terrified you must have been. Did your mother ever find out about that thrilling adventure?